FTL is a game about space exploration. Well, that's what I initially thought. Then I played it and learned that FTL is a game about survival. But then I learned that the game is about managing the crew of a spaceship. But the crew doesn't control the ship on their own, because the game is actually about balancing power and distributing it between different ship systems. But... system power needs depend on what gear is currently equipped to the ship. So I guess FTL is also about upgrading spaceships. The truth is... FTL is a game about a lot of different things. The important part is that they all work together and create something magical. I've been told by others that FTL is a "Roguelike" but since I've never played a rougelike I don't know if that's an apt description. I do know that in any one playthrough of the game you'll be doing all those things I mentioned above and, if you're like me, you'll be having a fantastic time doing them. I could write for paragraphs about the different game systems and how they all interact, but to get a true feel for the game it's easier to give an example turn. So let's do just that. My FTL is fully charged so I jump to a nearby node in my current sector. The node I jump to is in an uncharted nebula. My scanners notice a ship trying to hide in the nebula and I decide to investigate further. As I approach I notice that it's a slaver ship. It immediately powers up it's weapons and begins to unload on my ship. I power up my lasers and - realizing they won't be enough to get through the enemy shields - I divert power from my engine to power up my missile launcher. Now my ship has less of a chance to evade, but I have access to more firepower. I use the missiles to target their shield generator room while using the lasers to disable their engines. Unfortunately for me they decide to teleport 2 crew members to my ship to sabotage my shield generator. I have to pull my weapons officer, engine officer, and shield officer off of their stations to fight the enemy in my shield generator room. Our ships continue to trade volleys while our crews fight it out. Mid-fight I have to send my weapons officer to the med bay because he's so injured that he might die. My 2 remaining officers manage to eliminate the enemy but not before the enemy caused some damage to the shield generator room. My officers immediately begin to repair the damage but not fast enough to prevent a laser volley from getting through to my O2 room and causing a fire. Since so many officers are busy I have to pull my pilot out of the helm to extinguish the fire in the O2 room before our oxygen supply starts to dwindle. While the fire dies down a final volley of lasers and a missile from me destroys the enemy ship. I heal my officers, repair my ship, recover all the scrap I can from the enemy, charge up the FTL drive and get ready to jump again. And that's only one node. Not all of them contain battles. Others have friendly encounters, interesting offers, stores, merchants, distress signals, and the occasional optional quest. Each sector has around 25 nodes but on average you'll only get to visit 5-10 of them because you're carrying vital information for the federation and the rebel fleet is closing in on you. The game becomes a precarious balance between maximizing how much exploration and upgrading you can do in each sector while still staying ahead of the rebel fleet. When they catch up to you it's still possible to escape, but it becomes much more difficult. I haven't even mentioned the difficulty. I've sunk over 10 hours into this game already. I've done a "full" playthrough 10 times. I've played about half on normal and half on easy. Every game has resulted in my death. I still haven't beaten the game on easy. This game is tough. It really is about survival and one wrong move or bad jump can get you killed. Honestly, I haven't been this challenged or excited by a game in quite some time. I have a feeling that people who like devilishly difficult games are going to love this one. 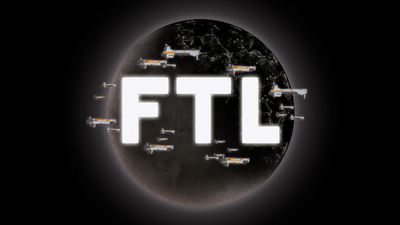 FTL is currently in beta but since I helped fund the Kickstarter I'm in the early access beta group on steam. The team has been amazingly responsive to the fans and new builds have been distributed frequently, every one having new features. With more features in every build I can't wait for the game to release so that the rest of you can experience it. I'll be sure to keep you updated. I thought about kickstarting this one, but cash is tight. Still, it looks good, and it's good to hear that it's shaping up well. Thanks for the writeup! No problem. I absolutely love how this one is shaping up. I hope you get a chance to check it out when it's released. I wasn't sure after reading your post, but your thoughts combined with the video convinced me. It looks awesome. It's a hard game to describe with words alone. I thought the video was needed for this one.